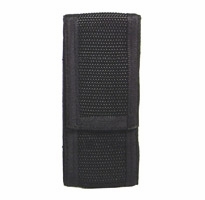 Made of heavy duty black ballistic nylon in the USA, these pepper spray holders have a belt loop and nylon flap with velcro closure to keep the can secure during any activity. The picture has been lightened to show the material better. Have 1.5 to 2 oz and 3 oz sizes. Will accommodate all of my brands of pepper spray, Fox Labs, Police Magnum, Sabre, Defense Technology Mace Gel, and Freeze. The 2 oz will fit any MK3, the 3 oz will fit any MK4. The 1.5-2oz will fit the Fox Labs 1.5 oz can as well as Wildfire, Police Magnum or Streetwise 2 oz cans. The 3oz will fit the Fox Labs 3.0 oz can and the Wildfire, Police Magnum and Streetwise 4.0 oz cans.